Well everyone has their own website in today's time. Work hard to build that website. And this is everyone's dream.Well everyone has their own website in today's time. Work hard to build that website. And this is everyone's dream. 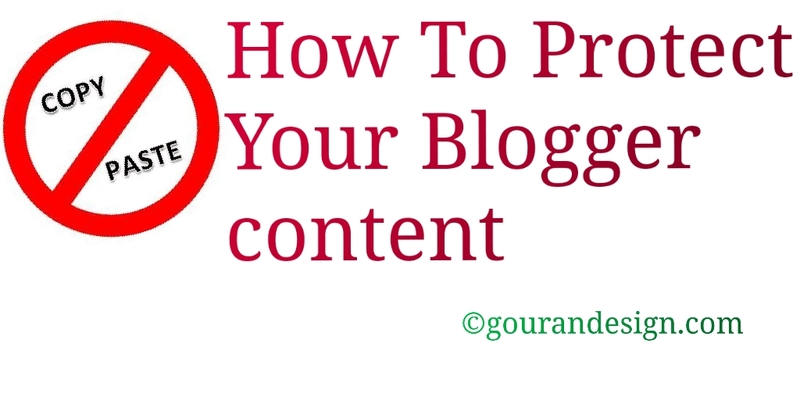 Today we are discussing How To Protect Your Blog Content From Copying. You write a new article every day. And your content is original. But do you know today that all wants to move forward..Because of this, people copy the content of someone else. And paste your blog and publish your post.So how would you feel if it was with you. One, you say so much. And second and second person enjoys it. ✓If you want any of your original content and no person can copy it, then you have to take protection for it. I explain to you this very well. None of your post will be able to copy it. I'll share this trick with you. This is a very simple way. But there is very strong tips. Which will be very useful to you. And one tell me I also use this trick. 👉I'll tell you two ways to prevent you from copying your content first. You can use whatever you like best.. But remember one thing I will do as I say. Otherwise it will not work properly. So read this carefully. And do as it is written. ✓This will be your first step. I'll give a code below. Which you have to put on your blog. To read her process, read below. I can use both of the two ways I mentioned above together. This will not have any adverse effects on your site.And both of them will work hard. Nobody will be able to steal from your blog Because it is a tested formula. If a person is incorrectly copying your post, then first find out. Then contact him.Tell him what you are doing is not right. Delete my post now. Otherwise I will take action against your site. He will be human if he is okay. But if your request is not listening and still is stealing then you take action against it against him. :- So friends How did you find our tips? Commenting to us And if you like it please share it in the Social site.So that everyone can benefit.. bye . Take care to all. Thank you .but you why added your blog link in this comment?.